German Import | A Passage to Rhodesia is ROME’s tenth album, but it’s safe to say it’s one of the most important releases in its long-standing career. The album unites instant dark folk classics such as “A Farewell to Europe” and “One Fire” with ambient collages in the best industrial and experimental traditions. Mastermind Jerome Reuter has accomplished a great swirling devil of a record, an epic and tragic masterpiece of considerable scale, rich in theme and philosophic inquiry. 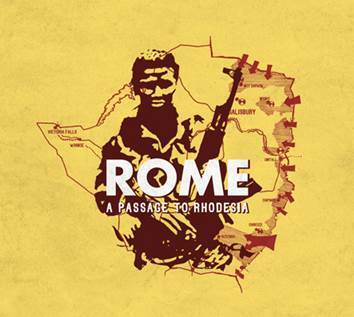 A Passage to Rhodesia is set against the backdrop of the Bush War (Bush as in jungle, not the American presidents) in the country named after imperialist Cecil Rhodes. The protagonists – a generation of Whites in Black Africa fighting and dying for a lost cause – are caught in a web of blinkered complacency and radical prejudice. Jerome Reuter takes an open-hearted look at the tragedies, insanities and absurdities of war-torn Rhodesia in the dog days of white supremacy in southern Africa. A Passage to Rhodesia is a remarkable, yet deeply disturbing odyssey driven by a strange love for the country and its people, a witness-bearing of the rarest courage.